Think about decking the walls of your baby’s room, your girl’s bedroom door, or even your own studio walls by putting a name to the face. 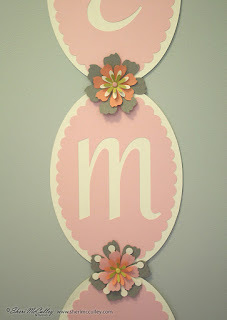 ~ and the garland for the name, with flowers connecting each letter (see photo below). 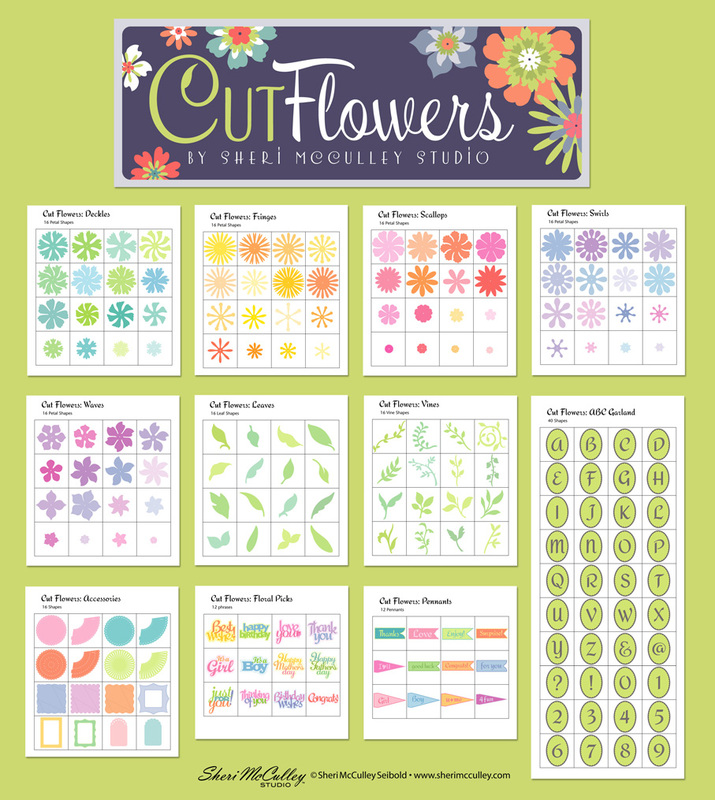 In addition to the Cut Flowers Alphabet, I chose flower petals from all of the Cut Flowers petal sets as well as the Cut Flowers Vine set. 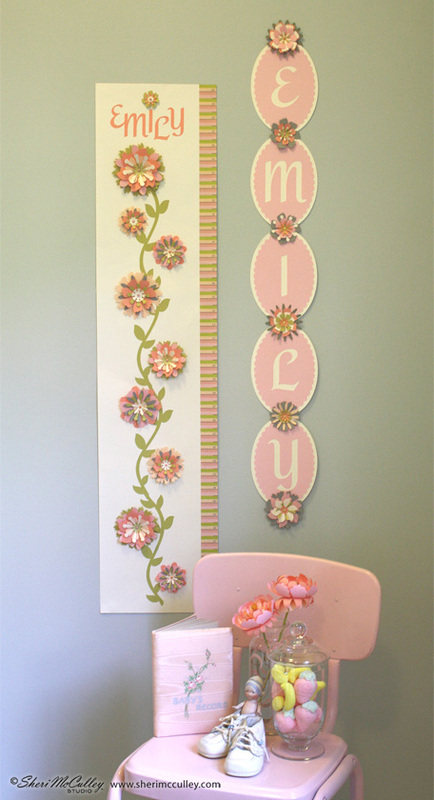 The vine set was used on the growth chart and the flowers were used on both the growth chart and the hanging garland. All of the flowers were connected to their bases with tiny brads in coordinating colors with the flowers. Above are a few close up shots of the growth chart to see how the flowers are built and positioned with the vines. I glued the vines to the chart first, then attached the flowers with the brads. 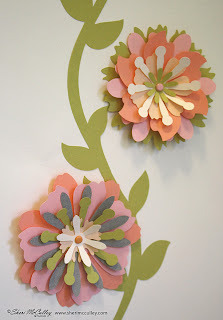 You might want to also glue the base petals of the flowers to the chart for a better hold. 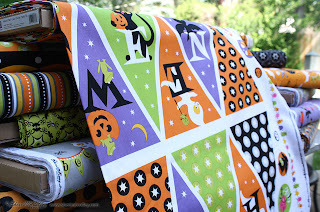 Do all of this after you trim and assemble the growth chart. If you would like to make the growth chart for your own little ones, you can download my free chart (in pinks or blues) by going to my U-Pick button at right and choosing GrowthChartPink1-4 (four 8.5 x 11 files total) or GrowthChartBlue1-4 (four 8.5 x 11 files total) and make these for the little people in you life. 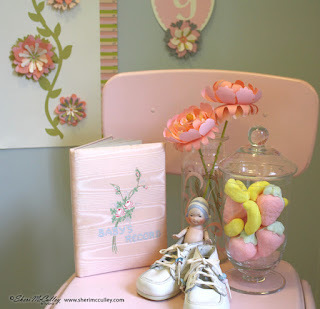 You can always use the blue growth chart with any of the other cut-it files from LD, because flowers might not appeal to the boys in your life, but trucks and sports always will. 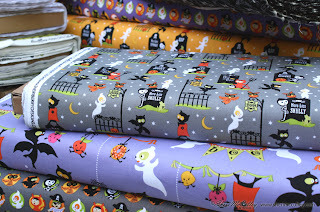 They have lots of cute art to choose from! 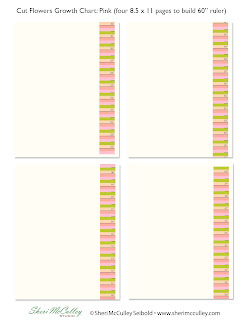 Above are samples of the free growth charts in pink and blue. You will need to download all four 8.5 x 11 sheets to print, trim and attach to make the 22"- 60" chart. 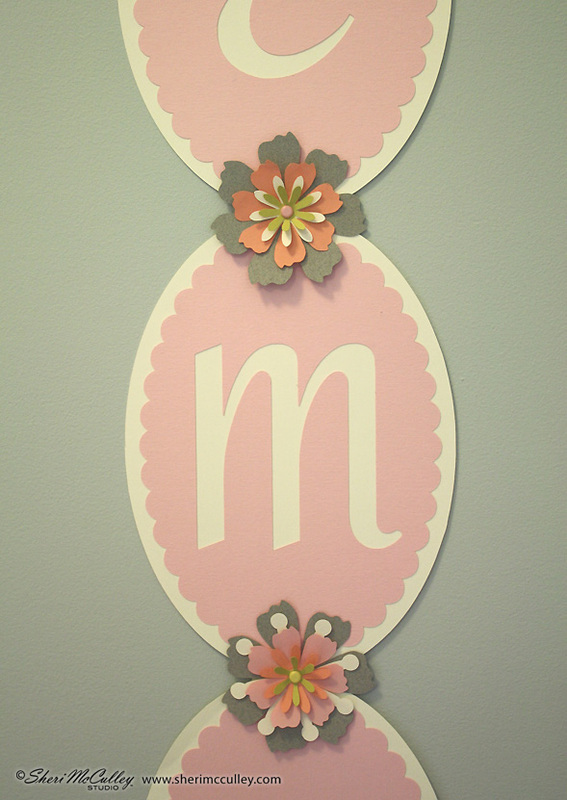 My growth chart is nine inches wide and 38 inches high (in length it is a 22" to 60" ruler). 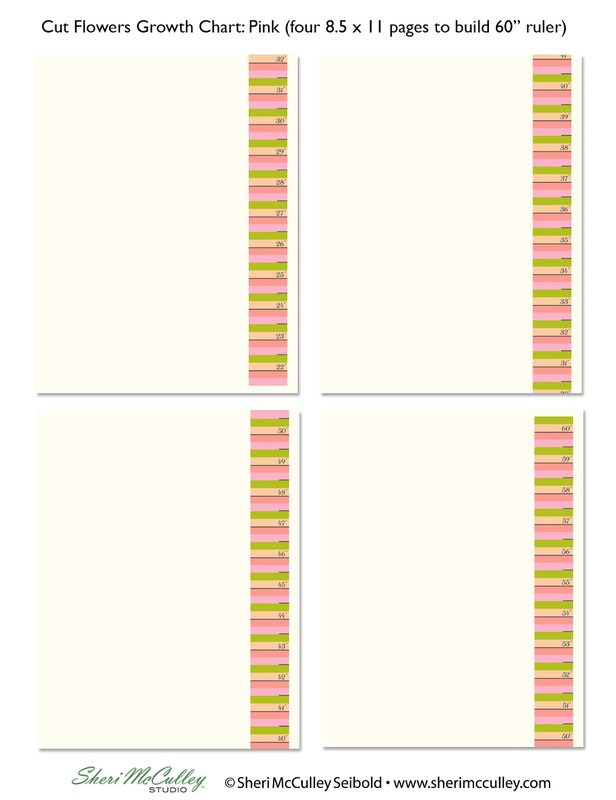 You will find the free charts in four files for pink or four files for blue, so make sure you download all four parts; (they are numbered 1-4 on the files). It’s in the bag, well, on it! 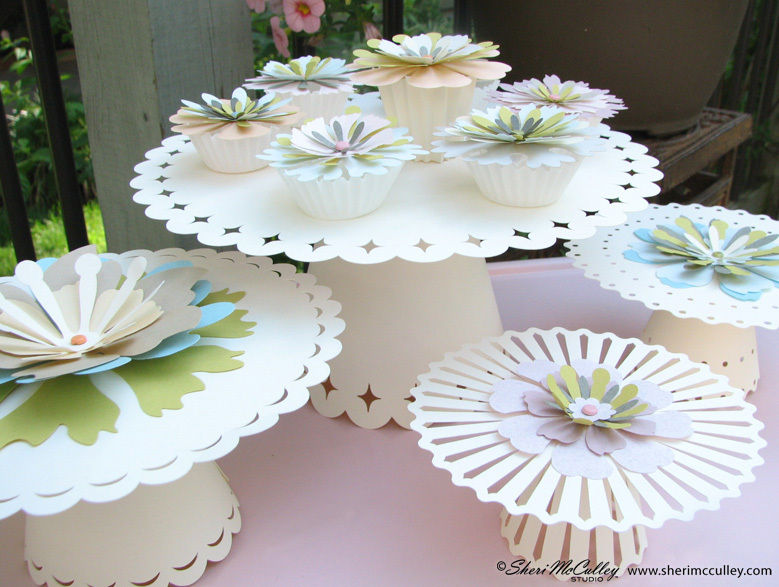 Time to share one of my favorite things about working with the Cut Flowers bundle from LD. This is my newest trick and I’m all about it. Think flocked flowers. And now think, humm . . . but how to flock the flowers, making them velvety soft? I found this fun but practical handbag at an estate sale and have been looking for just the thing to dec-it-out and make is a one-of-a-kind carrying case. Well, the idea came and the project followed. 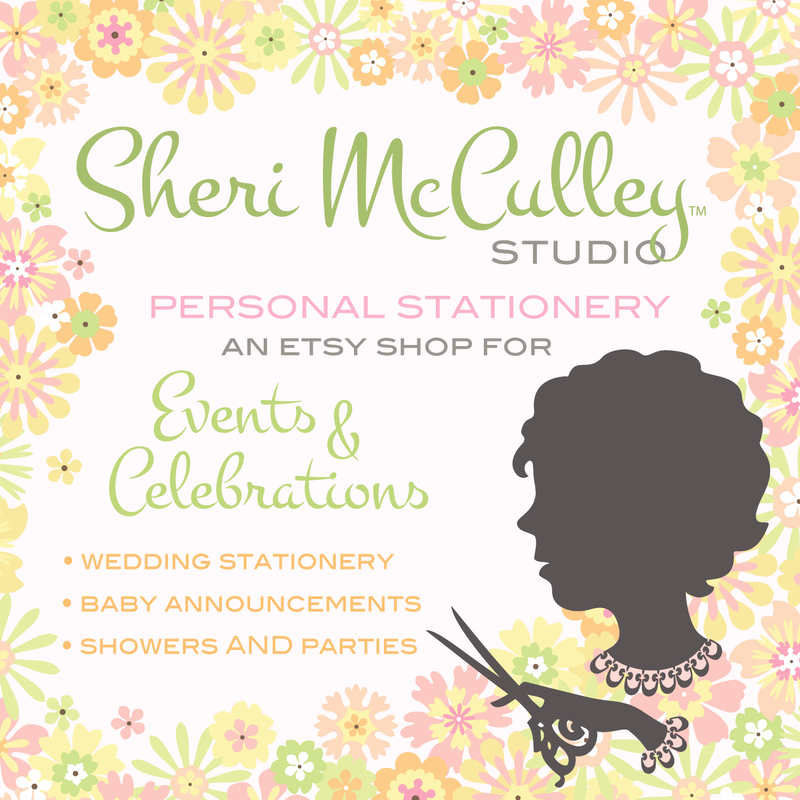 I have been using vintage, satin flocked ribbon (see photo above) with my Silhouette cutter and the results have been super cool. 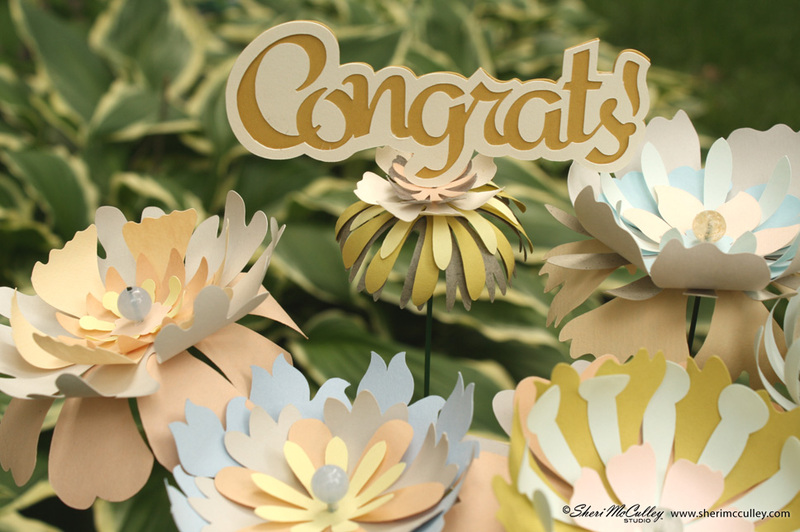 I simply stick the strips of ribbon to the cutting mat, satin side down, turn on the machine and watch lots-o-flocked-petals appear before my very eyes. 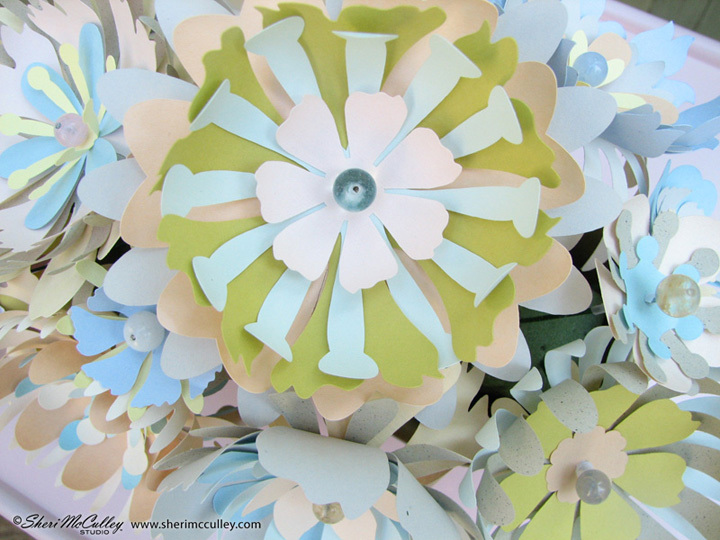 Next step is simple too, I sort and stack the petals to create flowers. 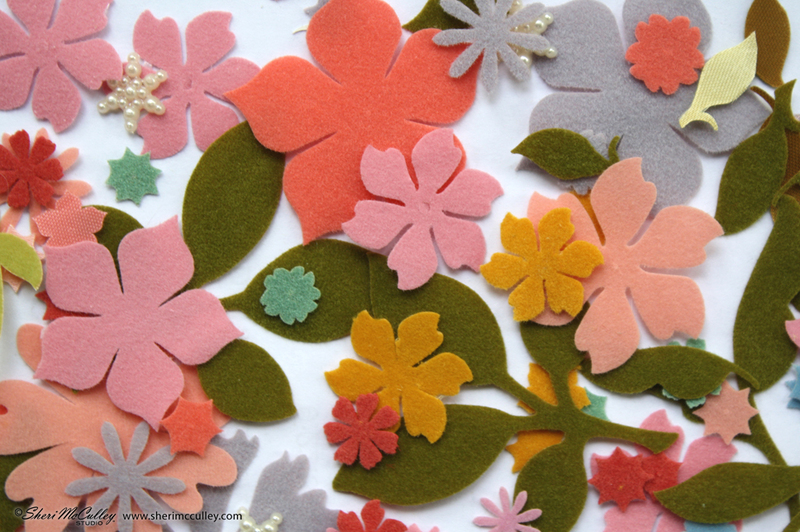 Add some flocked leaves. Stitch the flowers together with sequins and seed beads. Sew them onto the bag to complete the 60's styling carrying tote of coolness. 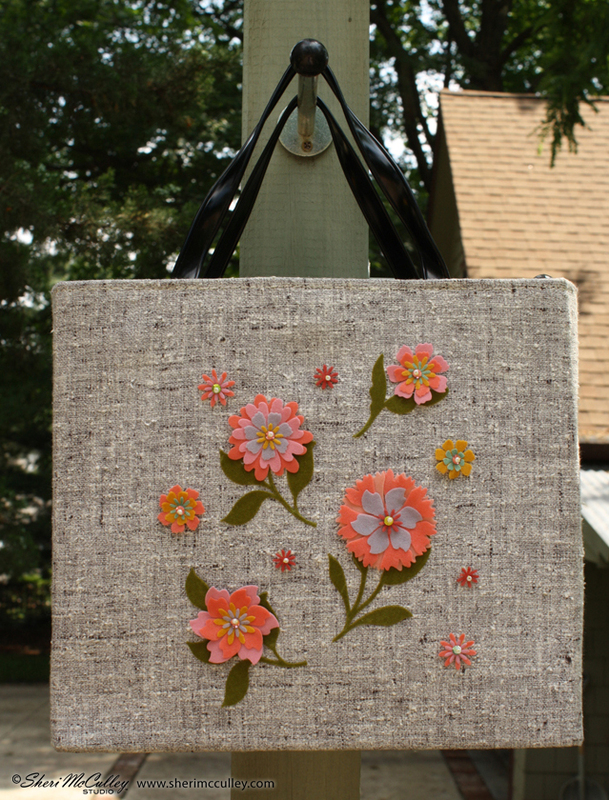 Okay, so the tweeded bag adds great texture against the velvety flowers and shimmering sequins. Lovin’ the gray texture against these throw-back colors of the late 50's. Hey, even the sequins are vintage to complete the older than thou and cooler than now look. 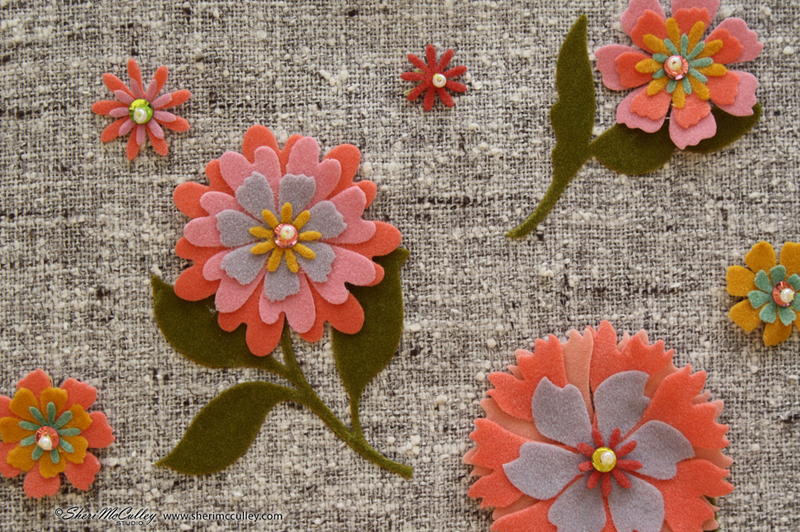 So, start thinking about the velvety softness of Cut Flowers. Get those files, crank up that cutting machine, and grab some florist ribbon (satin on back side and flocked on top side) to get in the groove with your 60's style deco-bag. 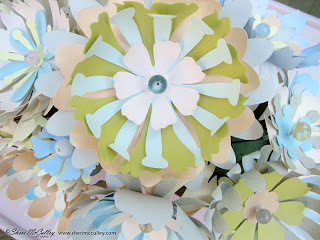 Above is a shot of the ribbon, to show you what I use for the flowers. 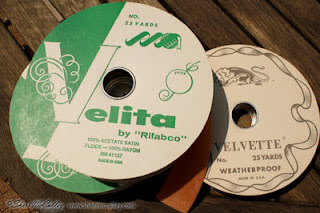 I think this type of ribbon is still current and available. Below is a shot of the ribbon and paper cabinet that opens up my little creative world to texture and color each day! 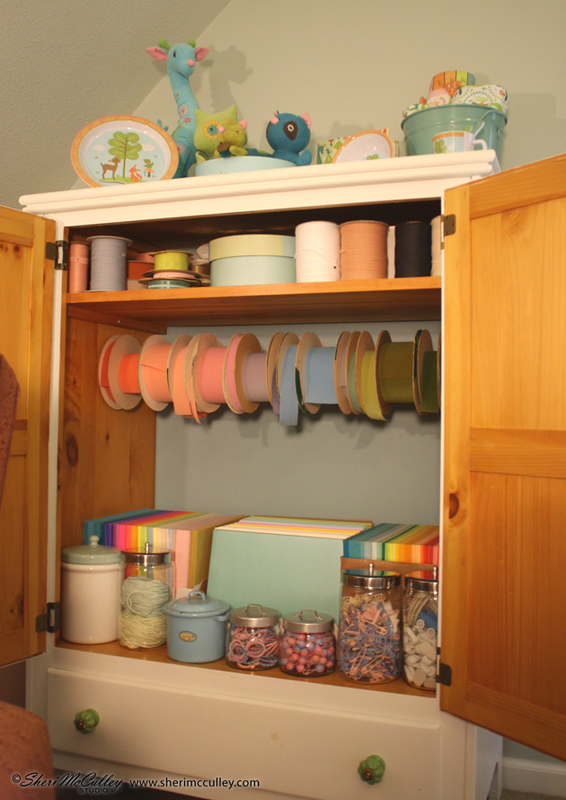 My wonderful husband’s handiwork is all about my studio (latest project~ribbon dowel in cupboard, below). He’s a master at making my creative world a functioning factory for my work and play. 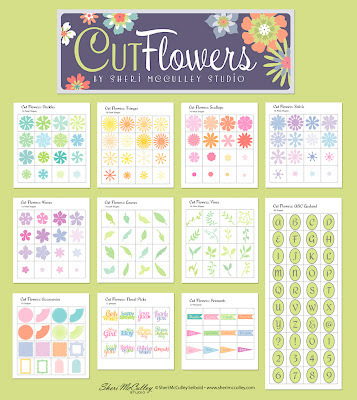 You can get the Cut Flowers bundle or individual Cut Flowers files at LD by clicking here, or go to my Sheri’s Creations button at top of blog. It’s in the bag, the cool, retro bag! 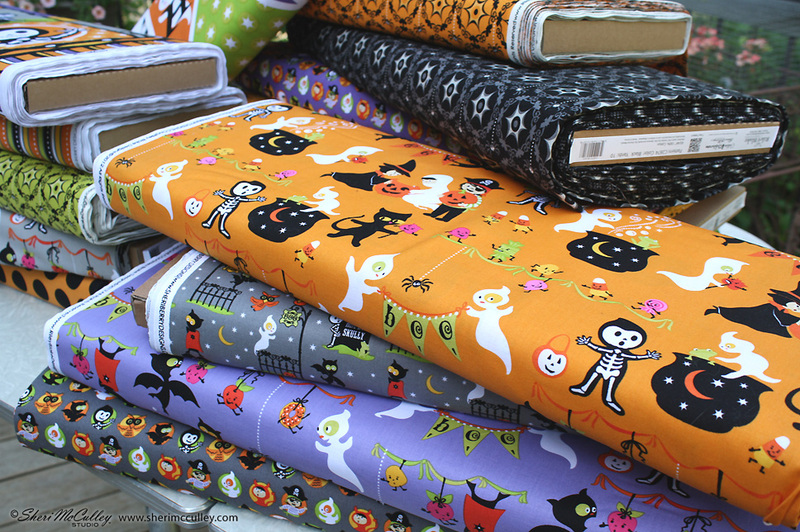 The costume kids are arriving early for Halloween, but don’t be tricked, think of them as a treat, maybe even eye candy, or better yet just candy! This year, the candy coating is thick with sweetness. 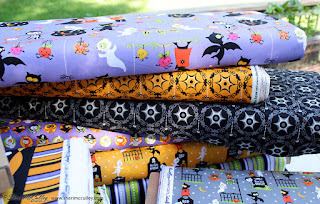 The Jolly Jabber, from the Fat Quarter Shop was kind enough to talk about the Costume Clubhouse collection and included a few fun facts about yours truly. You can go to their blog (here) to read the Q & A article. It will give a bit more insight into the creative process behind this collection. Thanks Jolly Jabber! 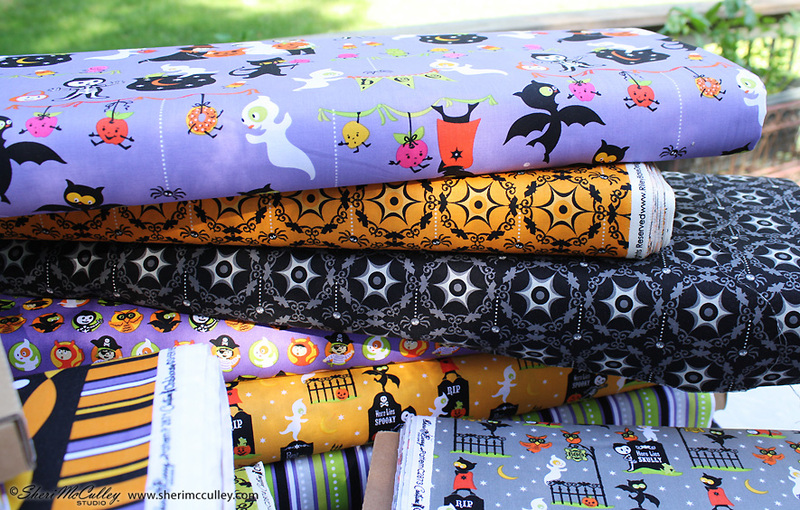 This halloween collection wouldn’t be complete without candy on the fabric scene. 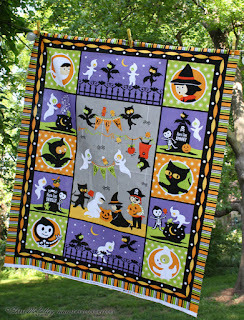 They parade around the bunting panel. 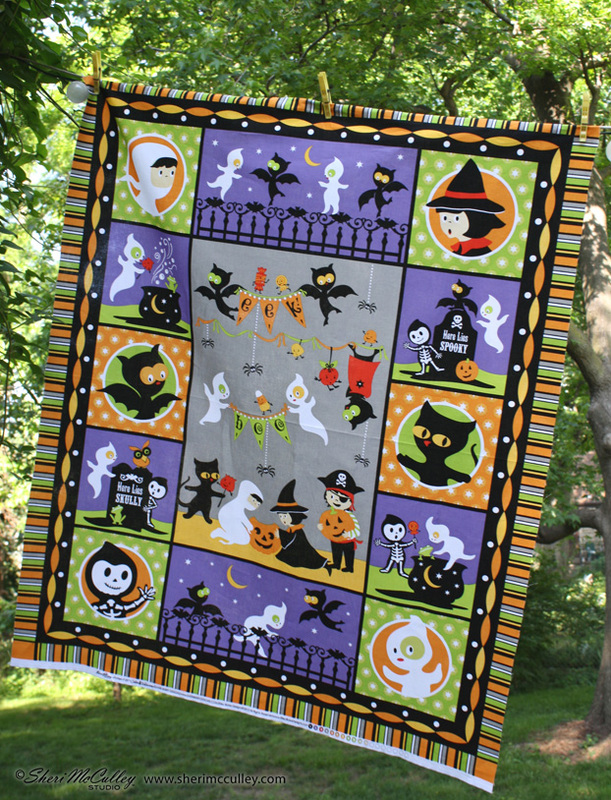 They dance across ribbons on the clubhouse party print and create quite a scene trying to escape the acro-bats who try to sink their teeth into them on the scene panel. 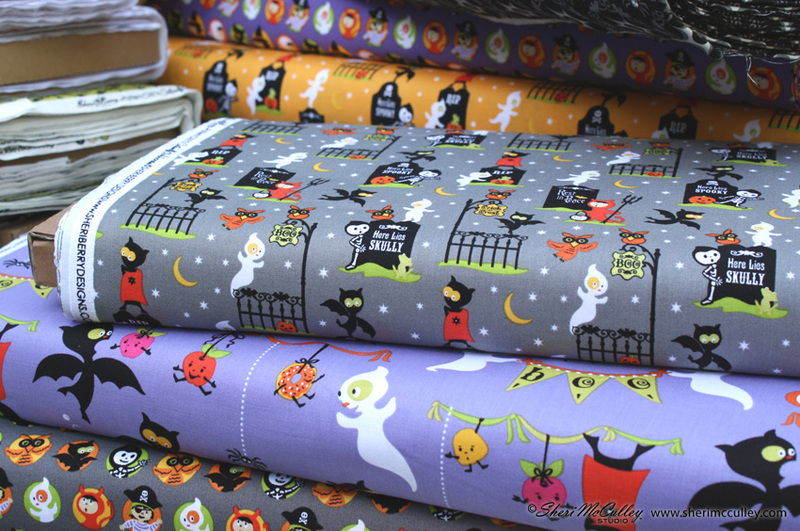 In additon to candy these halloween fabrics wouldn’t be nearly as sweet without the original Costume Club kids, ghosts and bats. There are a few new club members, see if you can spot them, and of course new places for them to haunt, obviously the graveyard for one. The Costume Clubhouse collection will be on display this weekend at the International Quilt Market, which just happens to be in my hometown, Kansas City. 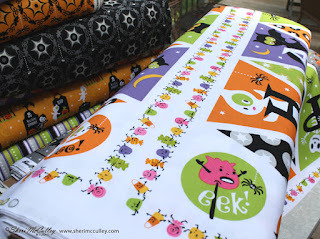 I will be checking in on the Costume Clubhouse kids at the Riley Blake Designs booth and make sure they aren’t misbehaving. Time to start filling the house with fresh cut flowers. You should use nature’s beauties if your thumb is green enough to grow your own, but just in case it’s not in your nature, try these as an alternative. These flowers are as easy as one, two, three; #1: cut lots of petals, #2: stack and shape, #3: arrange in vases. Here are some beauties in pastels and some in brights. Here are the additional pieces needed to build your own arrangements: bamboo skewers (I chose from these lengths ~ 16" 12" 10" 8"and 6"), floral wire (18" 18 gauge, silver or green), wooden beads for ends of skewer stems (10mm ~ see close up photo below), glass or plastic beads for ends of wire stem (make sure hole is big enough to slide over 18 gauge wire), and clear ear nuts (these are the rubber tips used for holding earrings to the ear) they will be used with the wire stems to keep petals on wire from slipping. You can also use green floral tape (not shown in photo below) to keep petals on skewer stem from slipping. Sleight of hand ~ to get the petals to bend just right, use a skewer to carefully pull each petal between it and your thumb while holding the other petals in place. Think of this as if you are curling ribbon when wrapping a gift. It works great, as long as you’re using a slight motion and gentle pull. Go Green with skewers ~ to color bamboo skewers, use food coloring with a bit of water to make shades of greens/aquas. 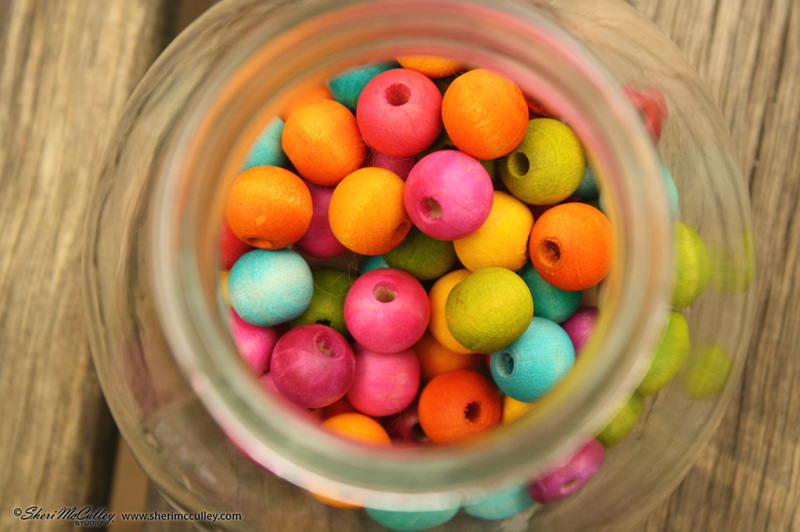 Use a cotton ball to apply dye to skewer (rub cotton ball along stick between thumb and fingers). You might want to wear latex gloves to keep your hands clean, unless of course you really do want a green thumb:) See various green skewers in photo below. Have a ball with color ~ dye wooden balls with same food coloring technique as explained above. This time have fun mixing a rainbow of colors. These will be used for the centers of flowers on the skewer stems. See photo below, and photo at top of post showing flowers with wooden centers. Get into a sticky situation ~ to secure the flower at top of stick, put floral tape just under the last petal. 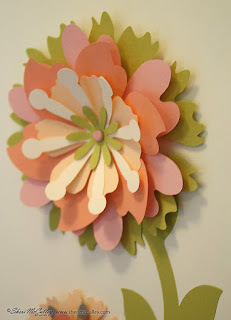 This can also be added to separate petals along stem and to keep petals from slipping. See photos below. Listen with your ears ~ these tiny rubber ear nuts are the perfect securing mechanism for keeping the flower at the top of the wire stem. 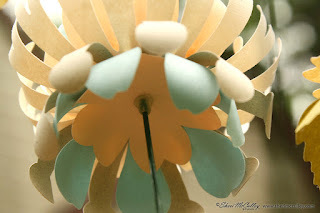 Once you create your flower and layer the petals at the top of the floral wire, use these ear nuts to slide up and over the wire to keep that flower from sliding down the stem. Find these tiny helpers in the jewelry section of craft stores. See photo below for ear nuts. A string of beads ~ use beads to finish off centers of the flowers on the wire stems. Consider getting second hand strings of beads at thrift shops and estate sales. You will get so many more for your money, and have a great variety to choose from. I keep a small piece of 18 gauge wire with me to make sure the bead hole is wide enough for my wire to slip through. 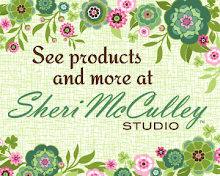 See photo below for bead centers. 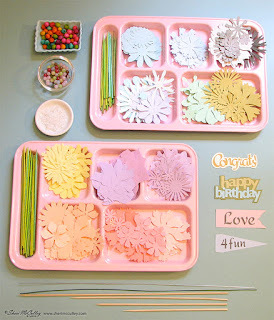 Here is the new way to keep fresh cut flowers around all year! 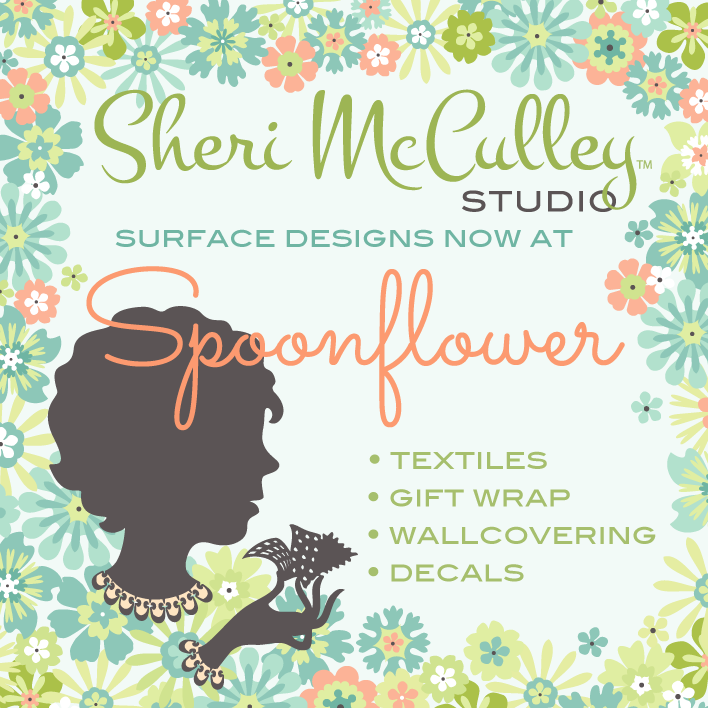 Go to Lettering Delights, or my Sheri’s Creations button at top, pick up the Cut Flowers collection by yours truly, and start growing your own bouquets to keep forever! What is in a name? 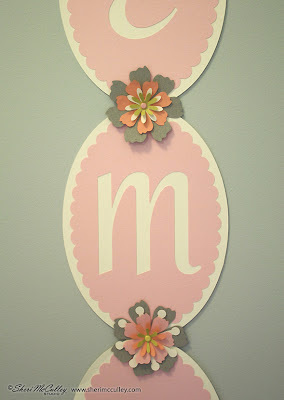 Mother, Mommy, Mom, Mamma and even Ma are names given to women who have had one of the most coveted titles in history. They are special people; they deserve this title, and once they earn it, they will keep it forever. 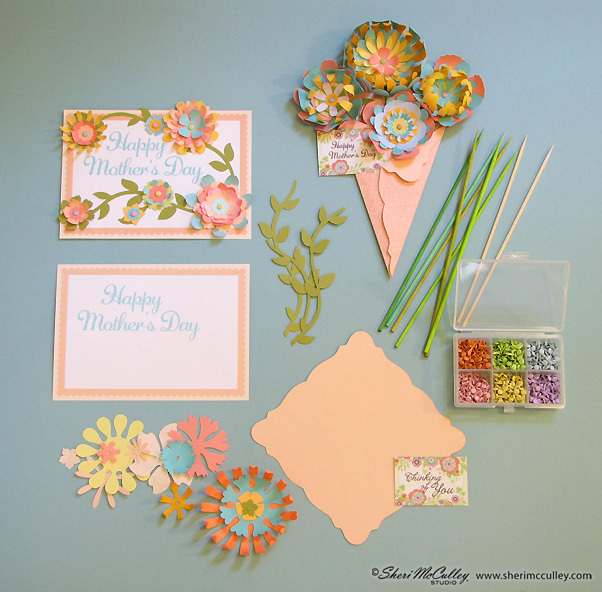 Since flowers say it best I thought for Mother’s Day this year I would share a project with you that can be personalized and given to all of the moms in your life. You can become the florist of Cut Flowers turned bouquets. 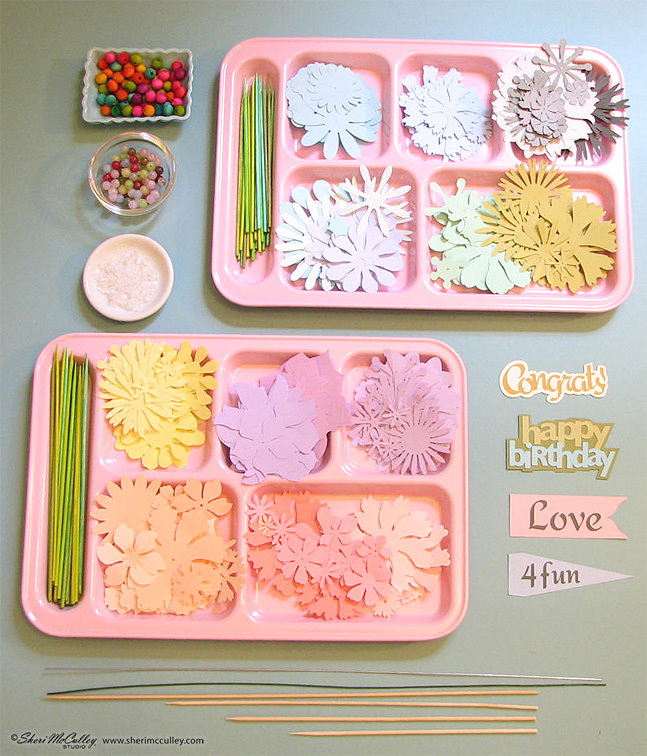 You can choose the flower shapes, colors and sizes. 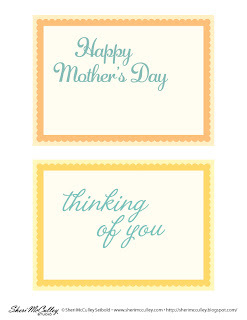 You can choose the vignette, and the best part is, you can choose your favorite mothers to share them with. 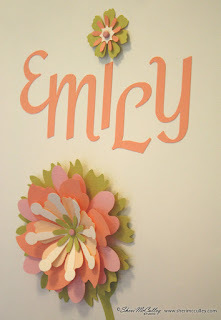 This is the first project I want to share with you from my Cut Flowers collection on Lettering Delights. To make the Mother’s Day card (shown on the easel) and the flowers wrapped in the paper hanky (shown below); as well as all of the flowers in the blue vase, I chose petal shapes from all of the cut flowers sets. 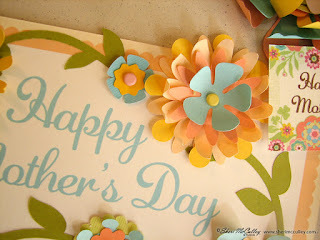 I also used the vines set for the leaves (on the card) and the hanky is from the accessories set. I will provide the larger card that reads “Happy Mother’s Day and the mini gift card as freebies, so you can complete these projects. 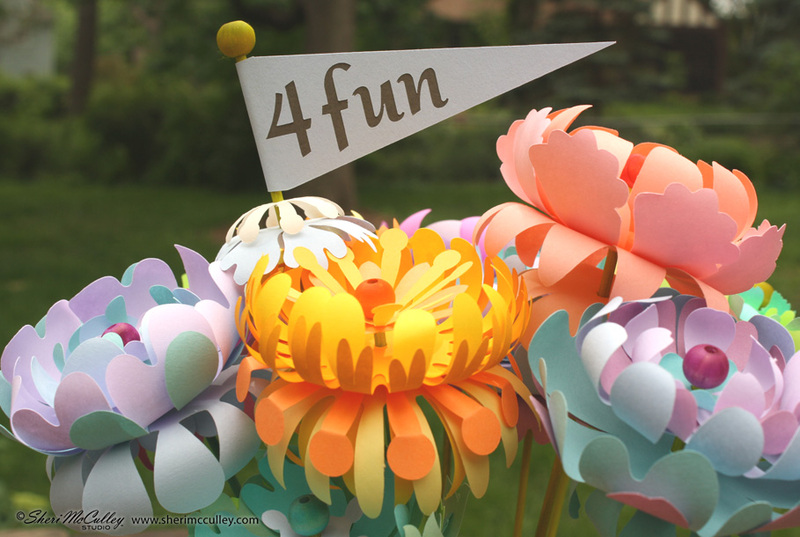 In addition to the LD files, to complete this card and paper hanky bouquet, you will need mini brads to hold the flowers together and you might want ribbon, twine or lace for the wrapper tie. 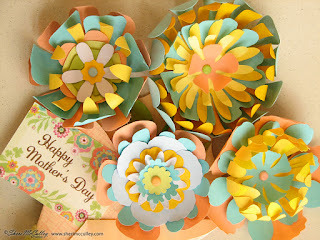 To create the card ~ once I had the large card printed and trimmed (download freebie from my U-Pick button at right), I played around with different layers, colors and sizes of the cut flowers sets (on LD), then put a brad through them to hold them together. I then cut the leaf vine pieces, trimmed as needed for positioning and glued them onto the card before any of the flowers were added. 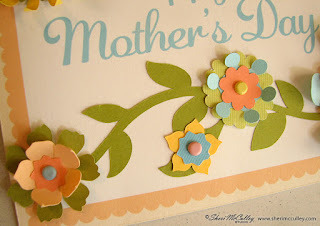 Once I knew where I wanted the flowers to lay on the card, I pin puncturing the card (using a thick needle) in the locations for the bradded flowers to be positioned and held. They did not have to be glued. To get the flowers to lift and curl I used a bamboo skewer (or a thin paintbrush handle works) with petal between it and my thumb to slightly bend the petals of some of the flowers. This provides a great 3-D look to the card. 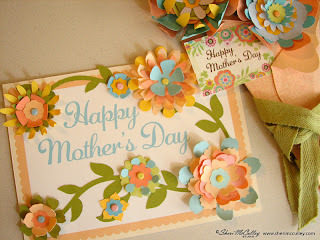 You may want to bend the flowers before attaching to the card. 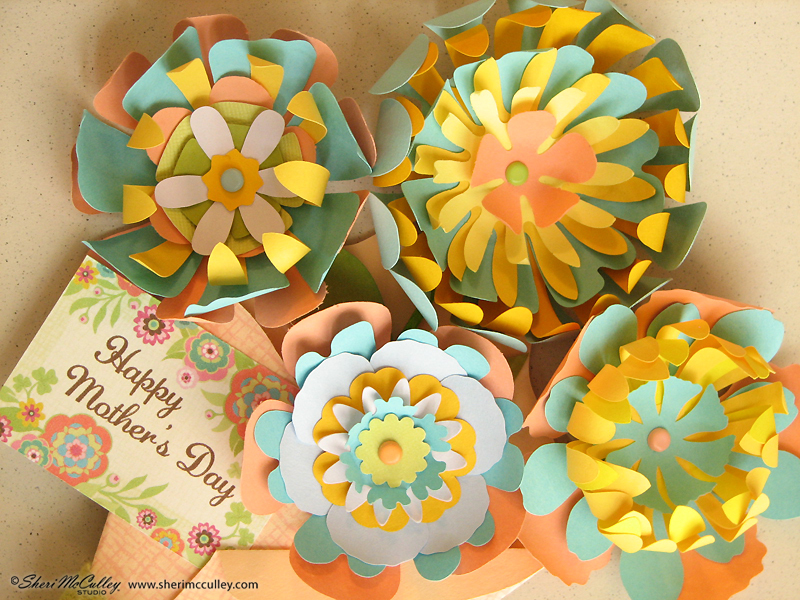 Think of this technique as curled ribbons on a gift, but be very slow and careful when bending if your paper is light weight so as not to tear. I used mostly 24lb. 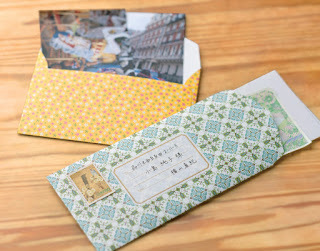 paper for this project (except for the card and hanky wrap). To create the bouquet wrapped in the paper hanky ~ I stacked and curled the petals and connected them with brads until I had four complete flowers. I then glued each flower to a small/short bamboo skewer to allow the cut flower to slide down into the folded hanky. The hanky had been cut and folded. I then positioned each flower, and glued the mini gift card (which had already been printed and trimmed) to the hanky. The mini gift card is also a freebie on my U-Pick button. In the photo above, you will see the samples and parts needed for these two projects. 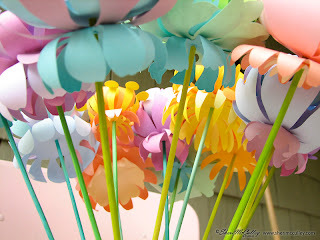 Tomorrow I will share helpful hints and tips for making the cut flowers in the vase. 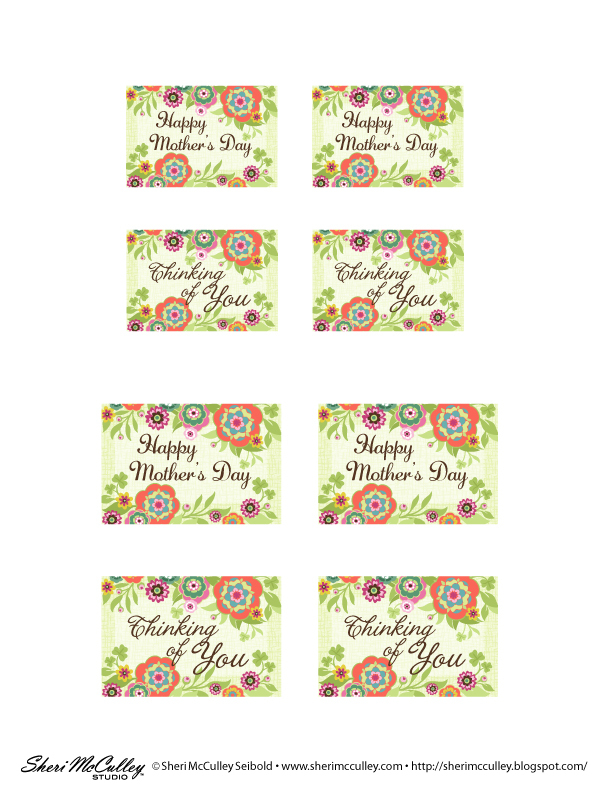 Here are the free cards to download from my U-Pick button, just click on it at right and choose the cards you want to print on 8.5 x 11 cardstock and trim as needed. 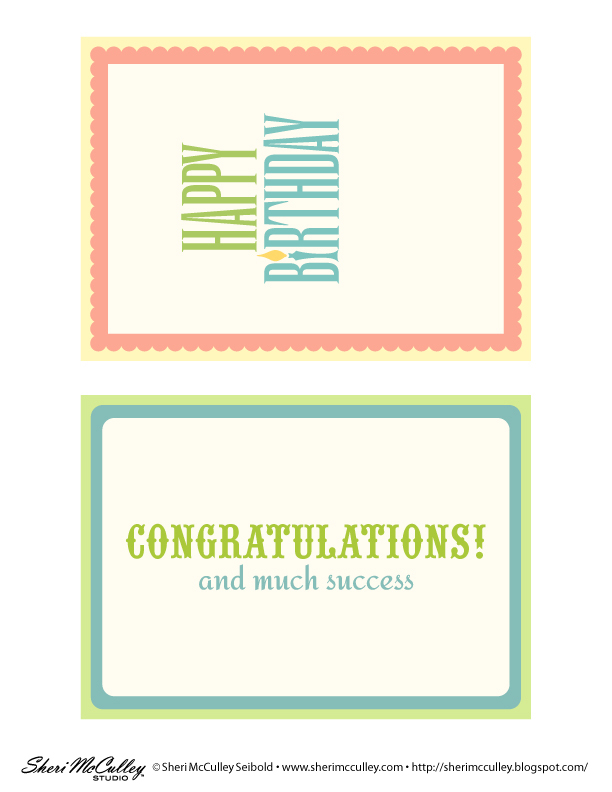 I also made cards for other occasions (thinking of you, happy birthday and congratulations) so that these can be used throughout the year. 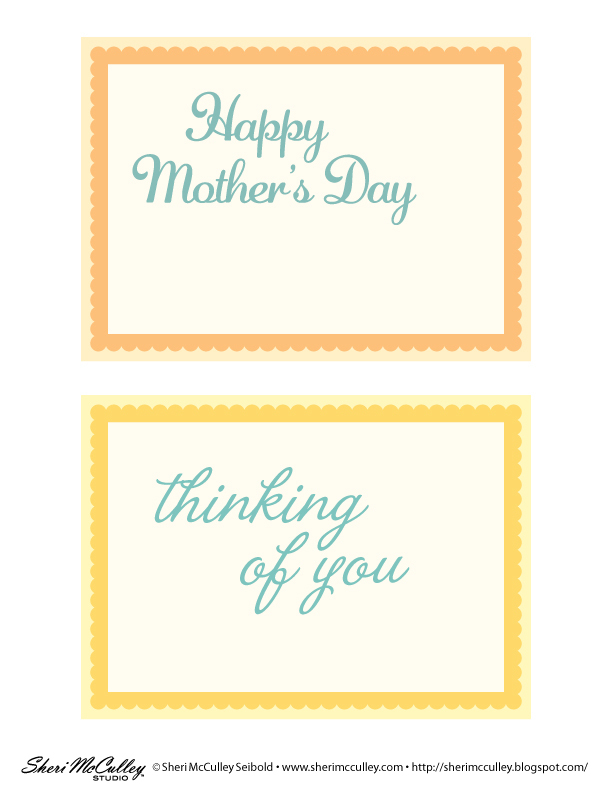 I made the mini card design with the additional option of “thinking of you” to print and use as well. Flowers say it better, LD says it best! 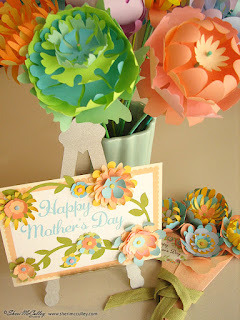 Now get to LD and see what kind of bouquet you want to personalize for your mom this Mother’s Day. 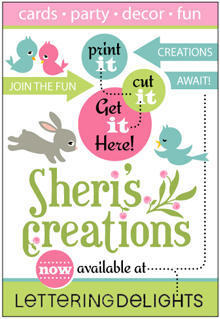 You can also click through to LD by using my Sheri’s Creations button at the top right. Happy Mother’s, Mommy’s, Mom’s, Mamma’s, and Ma’s Day to all you special women who share these names! 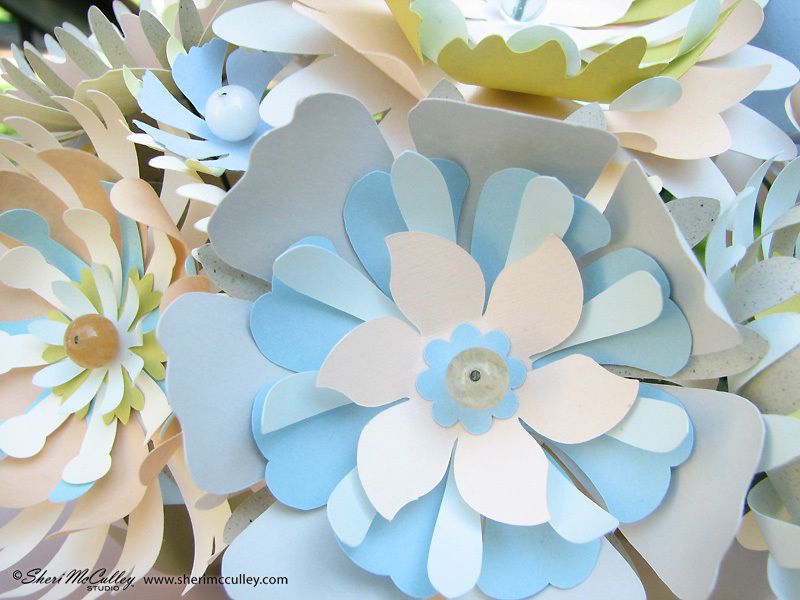 You have the flower power to create! Today Lettering Delights is debuting my floral collection called Cut Flowers. I’m quite excited about this collection because it consists of a variety of cut-it files with never-ending project possibilities. 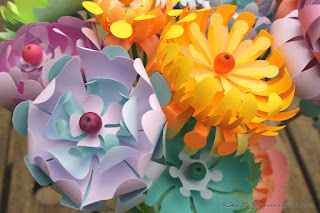 It is a collection that can keep you cutting fresh flowers all year long. When you choose Cut Flowers on LD you will find five sets of floral petal shapes; a set of leaf shapes and a set of vine shapes; an alphabet cameo set; as well as accessories, floral picks and pennants. These complete sets will set in motion your own florist shop, without the worries of wilting flowers. 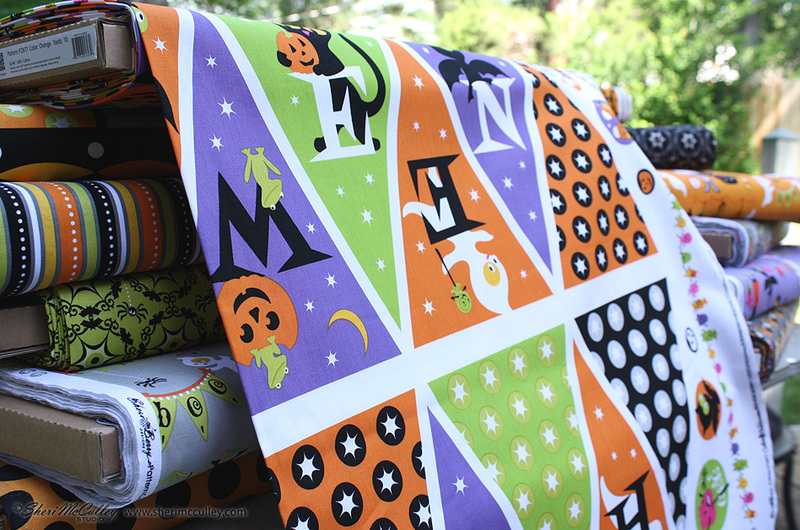 In the chart at top you will find the sets that are available on Lettering Delights, color coded for ease and fun. 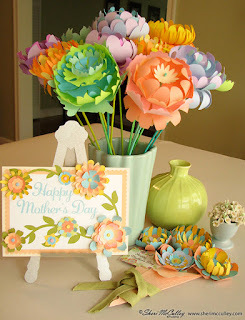 Of course you will want to make your own colorful flower arrangements to suit your style and needs, and with cut-it files it’s as easy as choosing your own shades of paper and cutting out the pieces. I will be sharing many project ideas over the next few weeks that can be made with Cut Flowers and hope you will check in often to see the latest arrangements, party themes, gifts, cards, and even décor that can be made with these Cut Flowers files. Here is a sneak peek of a few of the projects I will be sharing. and give baked goods a run for their money . 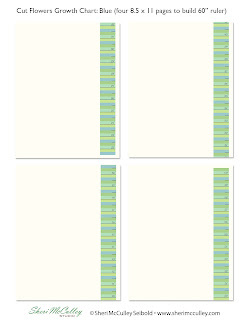 . . and that’s just the first few days of creating. 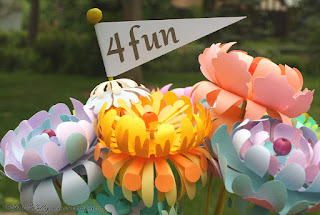 I can’t wait to see all of the projects you will create once you have the power that comes with the cut flower files from LD. Get over to LD now (or click on my Sheri’s Creations button at top right) to pick these flowers as they burst into blooms! One of the joys of working with companies in other countries is learning about their unique cultures, including customs that go beyond the simple images that often pop into our heads when we hear the name of a place. The week that just ended, for instance, was “Golden Week” in Japan, a series of national holidays that represent the longest vacation week in the Japanese year and apparently prompts a strong urge to shop! I didn’t know about Golden Week until a new licensing partner, based in Japan, told me that the stationery they were developing based on my patterns would be debuting to the Japanese public exclusively at a Tokyo department store during Golden Week. This project has been a year in the making, following a very fortunate encounter I had in New York last year with staff from Gakken Sta:Ful Co., Ltd., a leading Japanese stationery manufacturer. 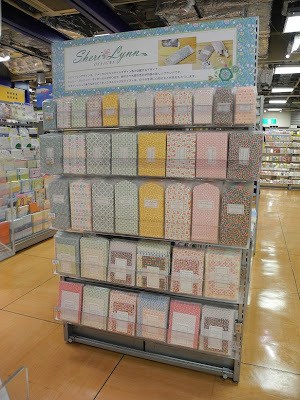 I am extremely pleased by Gakken’s selection and combination of my designs and color choices as applied to these little parcels of beauty now available in Japan. 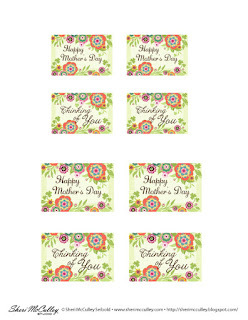 The full line includes eight distinct stationery and envelope sets, with address labels for application over the patterned envelopes. 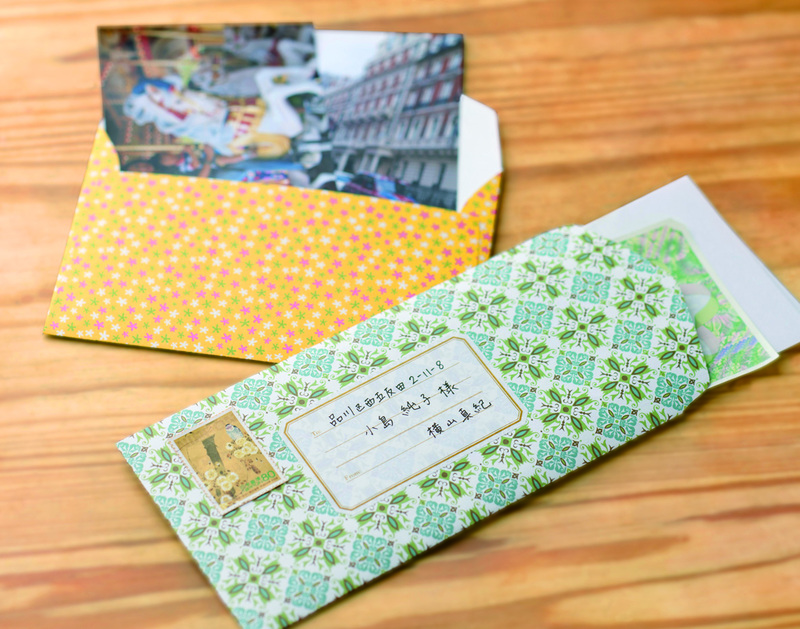 There are also eight different A6-size, or western envelopes, eight B-size or “oriental” envelopes with a flap on the narrow end, and twelve mini envelopes (known as “Pochi”-type, and typically used for gifts of money). After making the line available during Golden Week to a single department store chain (point-of-purchase display shown below), Gakken sent its salespeople to other retailers and took so many orders that they’ve already decided to make more! 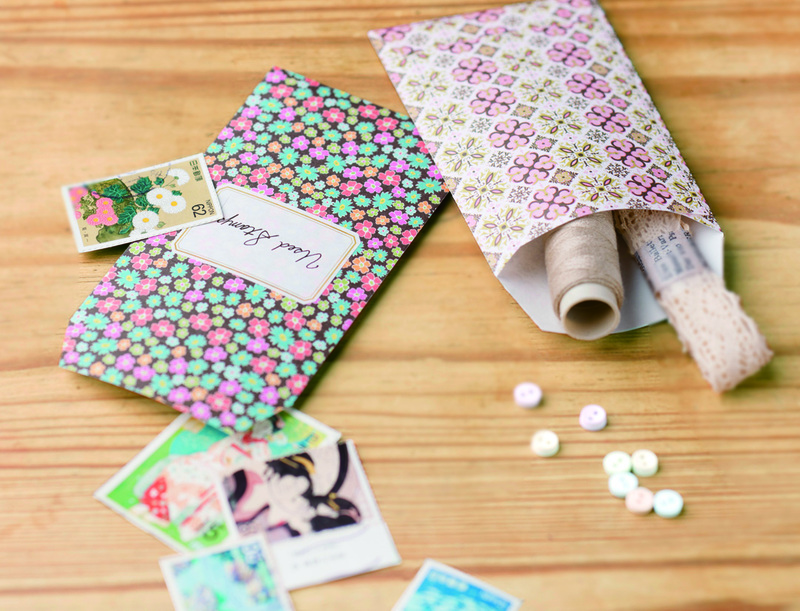 The line is also traveling back over the Pacific to Gakken’s American distributor, Los Angeles-based Ginko Papers, which will have a booth at the National Stationery Show (NSS) in New York this month. 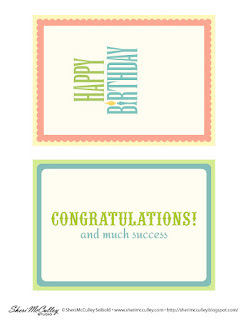 Even better, the letter sets from the collection have been selected as a finalist for the “Best New Product” category at the show, and will be on display in the lobby of the Jacob Javits Center where the NSS is held, right next door to the Surtex show I have exhibited at the last five years. 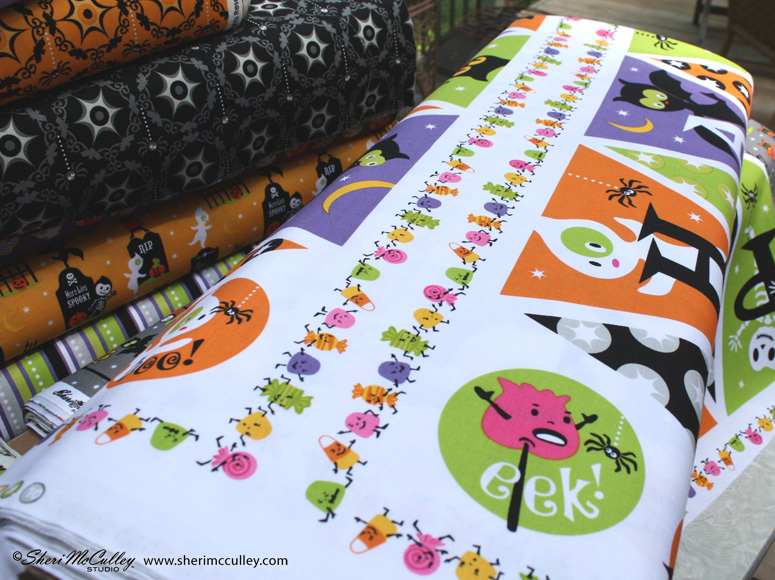 The products are being sold under the trademark “Sheri Lynn Designs,” a variation on my former “Sheri Berry” and current “Sheri McCulley” brands that Gakken felt would work best in their primary market. The Gakken staff who I have been privileged to work with on this project are as “golden” as their week. Their organization and attention to detail is extraordinary, a perfect fit for my own approach to making art, no matter how small the project or the product.